RENDERING COURTESY DESIGN PARTNERS INC.
A meeting with stakeholders and children from several Oahu schools led to changes to the playground site. The new plan includes adding more zip lines and a splash pad. 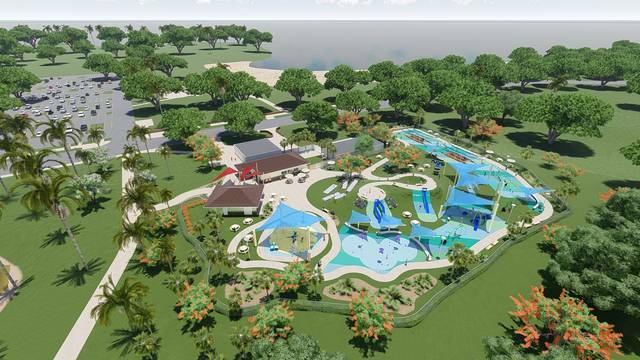 A volunteer group has obtained city approval to build a 1-acre public playground at Ala Moana Regional Park that includes miniature zip lines, slides, swings and a splash pad. Representatives of a group led by mothers said they intend to seek a building permit by the end of the year and begin construction next year. “It’s a bit ambitious but we are going to proceed,” Alana Kobayashi Pakkala told the Ala Moana- Kakaako Neighborhood Board at a meeting Wednesday. Pakkala, an executive vice president of local development firm Koba­ya­shi Group, which co-developed the ultraluxury Park Lane condominium at Ala Moana Center mauka of the park, said the volunteer group is already seeking donations to pay for play equipment and construction that was estimated to cost $2.5 million prior to some design changes. Mayor Kirk Caldwell said he’s confident the volunteer group will succeed in providing the city a playground for free public use. Producing what organizers call a “world-class” playground would realize a vision that began more than two years ago in response to the city’s improvement master plan for Ala Moana Regional Park that mainly focused on fixing or enhancing existing elements of the 119-acre tract that includes Magic Island. The volunteer group offered to produce a playground there for the city through private donations, and 18 months ago Caldwell said preliminary discussions were underway. Since then the playground site was shifted and the design overhauled after input from kids. Initially, the city anticipated having a playground in a relatively inactive section mauka of a concession and bathroom building near the Diamond Head end of the park. Now the site is another fairly inactive area near the park’s Ewa end, mauka of an L&L Hawaiian Barbecue concession and bathrooms. The playground’s design also was revamped after the volunteer group held planning and design sessions with stakeholders and consulted with children from select Oahu schools. This input led to changes that included adding more zip lines, having slides that start atop small hills and using natural colors instead of primary colors. Tiffany Vara, another group leader, said kids wanted more open-ended play and also asked for some old-school amenities. “They really wanted swings and monkey bars,” she said. Equipment selected for the project includes a globe-shaped structure that can be gently spun with kids on the inside and outside, swings for multiple riders and something that resembles two giant rocking chairs joined facing each other with a table in the middle. Six zip lines are also part of the plan. These work by riders sitting on a disc suspended from an overhead track and pushing off a platform to travel from one end of the track to the other while a couple of feet off the ground. Other elements include picnic tables, a splash pad and a retail concession to provide snacks and convenience items for parents and kids. Proceeds from the concession would help the city pay for playground maintenance, though the volunteer group also could raise money for this expense under its nonprofit, Pa‘ani Kakou. The playground would be big enough for more than 500 children and include features that can be enjoyed by kids with disabilities. It would be fenced to keep kids safe and to secure the facility at night. The city’s master plan for the park generally calls for improving existing features, such as replenishing beach sand, widening a pedestrian promenade, covering a drainage canal, reconfiguring parking and other renovation work at an estimated cost of $144 million. Nicknamed “The People’s Park,” Ala Moana Regional Park was built in 1934 and is used by 4 million people a year, more than any other general recreation park in the state, according to the city. City officials said in a June draft environmental impact report for the master plan that overall community feedback for a playground was positive in scoping meetings. However, some residents who submitted comments on the plan discounted the need for a playground.